The open water can be deadly, and Navy SEALs and SWCC must master this unpredictable element to make it their ally. This episode explains NSW's secret technique: the Combat Sidestroke. More info can be found at www.SEALSWCC.com. The open water can be both deadly and unforgiving. Before sailors become SEALs or SWCC, they must demonstrate mastery of this punishing and unpredictable element; making it their most valuable ally. I'm Daniel Fletcher, today we speak with ... See More aquatics expert Dan Kish at the Naval Special Warfare Preparatory School. 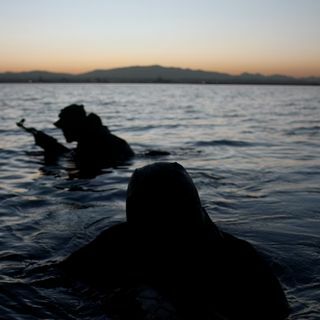 We discuss the best practices, tools and techniques used exclusively by Navy SEAL or SWCC candidates and operators, particularly the Combat Sidestroke. Let's DIVE in. DF: For starters, thank you for taking the time. Your expertise is super important to be able to share with as many people as possible that are trying to get successfully through this program. For starters, if you can just go ahead and spend a little bit of time talking about your role here in Naval Special Warfare, and then we can take it from there. DK: Sounds good. My name's Dan. I am one of the physical training leaders here at Naval Special Warfare Preparatory School, and my main point of focus is the aquatic side. So, it's much more than just swimming. We spend a lot of time on treading, water rescue, pool comp skills. My job is to help make the candidates as comfortable and confident in the water over the eight weeks here and plan and execute all the workouts safely to the highest standard that we expect of them. DF: The water aspect of, of kind of the initial exposure to the standards of the, the physical standards test is usually where a lot of people I think are at their weakest. At least most people have not been exposed to the level of swimming that is needed, required to be able to make it in the program or even kind of start training. So, I think that your information will be really valuable for a lot of people listening. Maybe if you could just start off with talking just a little bit about your background in aquatics. I'm guessing that you were a swimmer, or you were involved in some sort of water sports before you came into the program. DK: So, correct. I always loved being in the water. I was that kid you couldn't get me out of the pool, the lake growing up. I got pretty good at swimming, so I swam, you know, the aquatic kid, high school, club, college, a little bit of postgraduate swimming, so all the staff members are Division 1 swimmers, collegiate swimmers. Did some postgraduate swimming, was good, got into coaching, became successful at that, and I've been here since class 297, so just over five years now, and I love it. We get all walks of life from kids that have barely seen a pool, barely passed the PST to get in, to Olympic Gold Medalists and everything in between there, so all walks of life come through, and kids just want to learn, get better in the water, but water is majority of time their weakest, you know, environment to be in. We're humans. We don't belong in the water at all, and a lot of kids come to prep not prepped for what we're about to do here. DF: The focus of this episode is the Combat Sidestroke, and we'll get to that in just a second. You mentioned a couple other areas that your focus is on, whether it's treading water and stuff like that. Are there areas that maybe other than the Combat Sidestroke that people should maybe investigate in addition to that stroke specifically to at least kind of get themself familiar with?